The Holman-Lee Model Agency is one of the longest-established modelling agencies in Ireland, and is now a family run agency. The agency was founded 33 years ago by Celia Holman Lee, one of Ireland’s top models who is now one of the country’s foremost fashion presenters on TV3’s Ireland AM and RTÉ’s Off the Rails. Celia Holman Lee is this year’s winner of the prestigious KFW (Kerry Fashion Weekend) Best Dressed Woman in Ireland Award 2011. Celia was presented with her specially commissioned Killarney Crystal trophy and her KFW gong, a doll created in her own image, by Orla Diffily, organiser of Kerry Fashion Weekend. Celia also won the first ever inaugural Style Icon Award at The Peter Mark VIP style awards on 25th March 2011, which was held at the Shelbourne Hotel in Dublin. The aim of the award is to recognise an individual who has made a significant and long-term impact on the style industry in Ireland. Key traits of the winner include an admirable work ethic, the desire to foster and develop new talent, the sharing of expertise and the ability to act as an ambassador for Irish style. It was fitting that Celia Holman Lee was awarded the Style Icon Award in the tenth annual ceremony. She was an immensely popular winner, receiving a standing ovation from the 300-strong crowd. Celia will be a very tough act to follow at next year’s awards! Celia also contributes to all of the top Irish fashion magazines and won the first ever VIP Style Awards in 2002 and has not been off the country’s Best Dressed lists ever since. 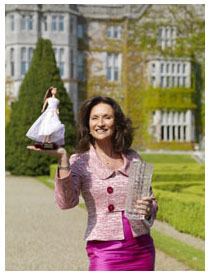 Recently won RSVP Magazine “Business Woman of the Year” Award 2008, came first runner up on RTÉ’s Jigs & Reels Irish Dancing Charity Show in 2007, also won top prize in RTÉ’s Late Late Show Charity Ice Skating Competition which the winnings of € 20,000 were donated to Action Breast Cancer Ireland. Her television appearances to date include the documentary The Agency on RTÉ 1 which documented A Week in the Life of one of the country’s top model agencies; guest appearances on Tubridy Tonight (RTÉ1),Podge & Rodge (RTÉ2), Seoige & O’Shea (RTÉ1), The Afternoon Show (RTÉ1), Xposé (TV3), Written Off(RTÉ1) and numerous appearances on The Late Late Show (RTÉ1). The Holman-Lee Model Agency prides itself on being one of the best catwalk agencies in fashion and production in the country. We cover a variety of work including fashion shows – big and small – editorials, promotions, catalogues, bridal exhibitions, wedding fairs and TV. We are also organisers of The Style & Image Deportment Course which covers deportment, diet & exercise, confidence building, hair styling & make-up.